Update to this post: I received a very helpful comment from a regular reader who caused me to rethink how I presented this book. I have re-written this post to try to more accurately reflect the fact that I read and approached this book as a learning tool. I've attempted to take a little more care in stating that I understand Wilson is someone who is surrounded in controversy. I do not talk about this book to recommend either him or his theology. Rather, I'm honestly writing this review for myself (as always) to remember two things: 1.) This is a book that I did read; and 2.) What I learned from it. Please take it no further than that. Yesterday I talked about a book I didn't like, so I'll balance that out by talking about one I do! 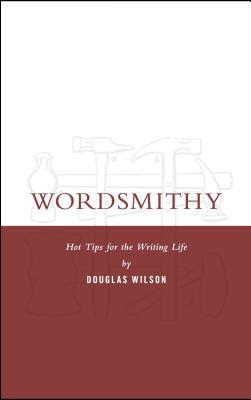 I hadn't heard of Wordsmithy: Hot Tips for the Writing Life until Katrina mentioned it around the tail end of her Spring Reading Thing. It being Doug Wilson (who I read less of these days) and it being about improving writing skills, I thought I'd give it a go. Personally, I enjoyed the book for it's writing tips (only). However, this is not a title that's going to fly with the general public, I expect. Perhaps not at all. Please understand that I'm writing this review more for myself, because I read it, and less as a recommendation. I don't feel as I can make a recommendation of Wordsmithy for theological reasons which do not at all relate to the topic which this book addresses. This book is very Wilson-esque in it's style. Since he is writing about the practicality of learning how to write well, and not trying to present some great theological point (although you could argue that one's theology does dictate whether or not they desire to learn to write well) then he's a bit more flippant with his pen this time 'round. More so than usual, I'd say. To that last sentence my only response is to slap the table and let out a loud, "AMEN!" Words matter. The order you put them in matters a great deal. It is important that we learn to pay attention to what we're saying in our daily, oral life and take just as much care (if not more) in our writing life. I assume it goes without saying that blogging is writing. Take care what you say. Learn to say it well. That's a tall order! Read! Read! Read! Wilson spends an entire chapter on why it is important that you read well and widely as you prepare and practice your writing skills. He exhorts his reader to read to know what makes good writing and what makes bad writing. Read to gain literary experience and also life experience. One thing he says a few times during the whole of the book is, "The more you know, the more you CAN know." Tackle hard books. Take time for easy ones. Be a versatile, interested reader. The wise man is quick to listen, slow to speak and very, very slow to anger. Remember that God speaks to us through others so listen for the truth in the critique of another and be humble enough to make changes where necessary. This is the hardest piece of advice, but I think the best that Wilson has to offer. It's definitely the one we need to be reminded of the most frequently! On the whole, I'd have to say that reading Wordsmithy was a positive experience. He provided several useful tips which I've instituted on the sidelines. He changed the way I think about the types of books I read and challenged me not to become too comfortable in my preferred genres and authors. I found much to appreciate within these pages. But whether you would like it, I cannot say. Enjoy if you can! I'm wishing now I had read the first draft, just to see what you said differently. :-) I saw it this morning but saved it for later today when I had a little more time. I've heard good things about this book. I don't know enough about Wilson to know what theological stands he takes or what kinds of controversy surround him. What times someone has quoted him or linked to him, I found him somewhat harsh (and one quote was defending his harshness under the broad umbrella of satire). So I'm not naturally drawn to read any more of him. But then again, I have heard this recommended and I do agree with the quotes you've mentioned here. So I don't know. Maybe some day. That said, like you, I appreciated the writing tips (greatly, in fact), but agree that certain aspects of the book will be a turnoff for many.